I bursted out with laughter from my sleep around 4.30am when the Muslim call for prayer started…why? Day1 2doer complained of being disturbed in his sleep by the “too doo” receptionist. Day 2, I disturbed his sleep. This morning, not knowing there was a mosque behind us we were awakened by the call at 4.30am from the speakers!! Sleep truncated, I tried writing the report for day 2 but couldn’t summon the mental strength. Oh well, the ride must go on. We agreed to leave by 8.30am but did not roll out till 10.30am. I digress here to the previous night, when the police swooped on the second hotel after hearing there were strange goons on bikes invading the sedentary town…Daniel helped resolve the issue by educatingthem on who we were and also that we were guests of the Etsu Nupe! Royal guests we were. Back to day 3. Rolling out, Daniel took us to a pre arranged filling station to fuel up, two bikes had barely filled their tanks before pandemonium broke loose as the locals started fighting the ⛽station officials. Reason: the station should have sold at the pump price, not the N160 they were selling! Quickly, we ran away from there before the story plenty. As we were heading to another station, the RR claimed its first casualty – REX the GS. Clutch just packed up and the donkey refused to move any further. I noticed from my mirrors and stopped ahead. 2doer sweeping, stopped by him, asked what happened, then moved to me to explain the issue. The backup truck had just disappeared so, 2doer went after it. Two minutes later, the Toyota Hilux came and with no time to waste, Rex was bundled unto the Hilux, tied down and in that moment, Rex became a pillion(need I mention that there was a 15mm tie rope awaiting such situation in the hilux – thanks to PRMC’s Chuka). Sadly, Rex’s jockey now had to ride in a cage. I could feel his pain. The GS clutch is not what just any mechanic can handle, because the bike has to be broken into two to get to the clutch. And so we progressed to the next station, only for the same fracas to occur there. So we decided to leave this unfriendly town. As part of our tour, we were to pay a visit to the Etsu Nupe (Emir of Bida), but he was in Abuja for a meeting, and had delegated his PA and council of chief to see us. 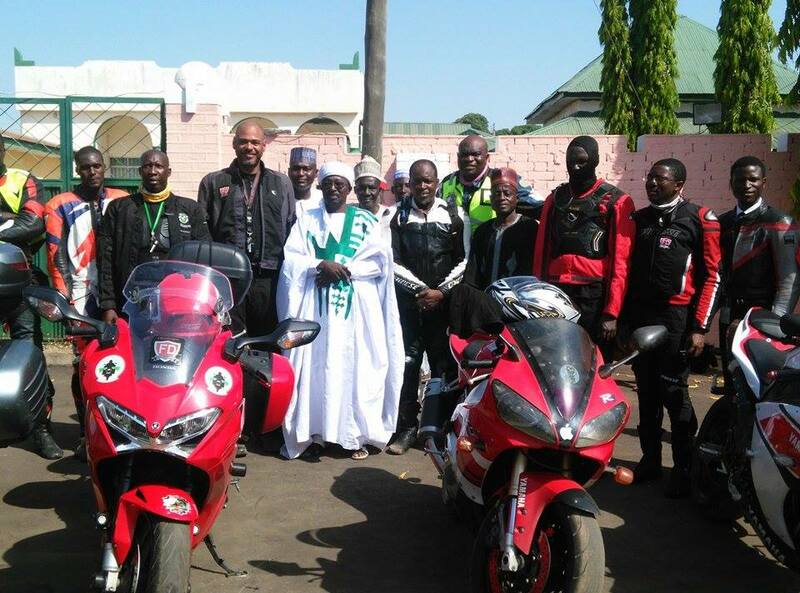 So we rode to the Emir’s palace and were received by these dignitaries. As expected the Sardauna was our spokesperson and when he introduced himself, our hosts were in shock and awe that he would take off his turban and regalia to mount a metal steed! This brought some change of perception and new admiration to biking for our hosts. Sardauna then explained the RR and our purpose, using the map on the backup vehicle to lecture our hosts. Then he introduced the guys. When he got to 2doer, he regaled our hosts with his exploits within Nigeria, Africa and the world. Based on this, the Emir’s emissaries conferred on 2doer a knighthood! He was dubbed Sir LivingStone of Bida and Nupe land. The knighthood was completed with the presentation of a basket of premium Kolanut and refreshments. We then took pictures and our host insisted on taking pictures on the 2doer! By now, Daniel had got another fuel station that was selling on the way out, so we headed there only for the attendants and manager to take off when they heard the bikes! Wahala!! Five minutes later they came back after realising we were not a task force from DPR. Then we all filled up and finally headed out of BIDA!! It was already past 1 pm. Bida – Mokwa was a blissful ride. The Road was straight, smooth and occasioned mild twists. Those learning to bank would learn fast on this road. Nothing spectacular on this stretch just the constant 120kmph, good road and Craig Mack dropping dope lyrics and beats in my ears. There was one thing though, as we passed a school in Kutigi I saw a student in the sun kneeling down in front of a classroom and carrying a big stone….hmmmm wonder what he did…reminded me of my secondary school days back in the…’s!! Guess the decade. After 128km having moved ahead of the pack, 2doer and I got to the junction where the road going to Sokoto meets the one from Bida and both head to Mokwa. Here we waited for the pack to catch up. In a short while they arrived and we were informed that the RR had taken it’s second casualty! Rewind – apparently as we were leaving Bida, the BMW K100 (approximately 35 – 40 year old bike) and it’s jockey had a brief romance with the asphalt and a longer one with the grasses and the shrubs. Why the romance? Eagerness to catchup with the pack, mentally unbalanced homo sapiens behind a caged steering wheel. Draw your conclusions. A short while later the back up vehicle and the K100 arrived being ridden by Ayila Spyrogyra, our tour cameraman who is also an adept off-road aficionado! We checked on the jockey he was fine and Sardauna administered some medications to him and he returned to the vehicle to recuperate. Asking Ayila how far with the bike? 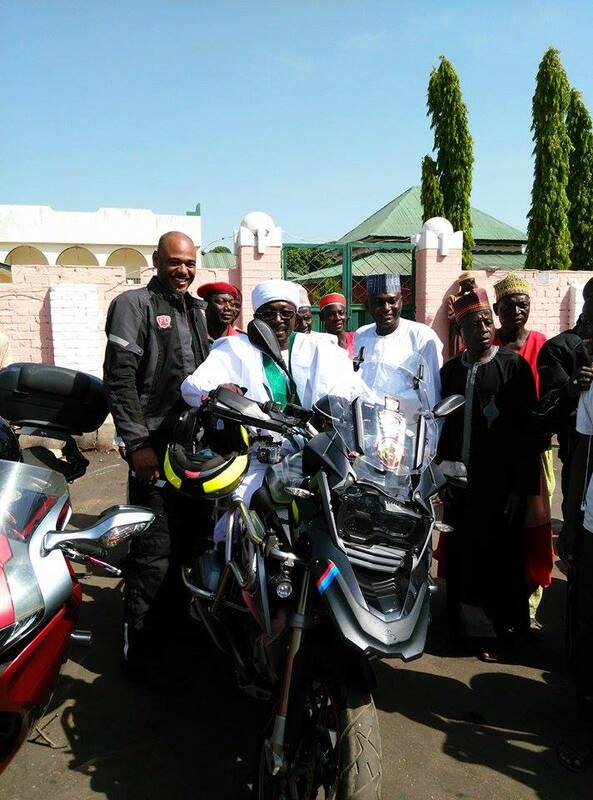 And he says “forward ever, this bike is going to Lagos!” I felt very proud to be riding with the men! Damage was accessed and Ayila was told to proceed ahead of us. Rested and watered, we rolled to Mokwa, having advised the group about the Mokwa-Jebba twisties which have a regular habit of flipping trailers and tankers belly up. We got to the Niger bridge, stopped and enjoyed the wonders of nature. We kitted up again, rolled past Jebba and almost immediately after the Niger bridge, a torturous, treacherous, tyrannical road appeared before us! No choice, we entered it. Minna-Bida was child’s play compared to this. Formation was abandoned, but Sardauna still led and we soldiered on. I had to stop my music as all concentration would be required. There was 200m of dirty asphalt and 2km of no road at all – just pure off road with stones and two-inch thick dust! Thankfully it hadn’t rained so we had to battle only the dust and no road. With the busted shock in mind, I rode with all five senses in the 38-degrees heat. After a very long and arduous portion, I stopped and parked to appreciate the road. As I was appreciating the wickedness of the road, Fuego the Concourse who was behind me continued as he passed, I saw it was leaving a trail of black line on the road…OMG!! The RR had claimed a third casualty! Five kilometers in I saw 2doer make a U-turn and as he passed by me, he just said “turn.” I was like “for what! Lailai!” On second thoughts maybe there was another road or we were to camp at Bode Sadu for the night. So I turned back as the others did too. After two kilometers, we came to a junction that wasn’t there before! For real O! We all parked and waited for the others. Everybody had turned, but the Sardauna. With 2doer leading and me sweeping, we got on this road that was a blessing, not caring where it led to! We just blazed through the villages doing good speed and that’s how we got to Ilorin around 5.30pm, with 46 waiting for us having rode in from Lagos earlier. I gathered the surgery on Fuego failed along the way and they had to stop and improvise with four-minute gum which held and brought Fuego to the E-Phoenix Hotel, our anchor for the night. As we were settling in, Xratch & Gomesea roared in from Abuja, Sardauna having done the entire off-road course and Ayila K100 came in and finally, Fuego and the hilux all docked in. We had dinner and everyone went to crash after the gruesome day. I was running behind on my report so had to struggle to get the backlog out. I started day second day’s report but fatigue took over. I told myself I would continue tomorrow, it had been a very hard and eventful day only 294.6 km O! but thanking God for his mercies, we were all in.